You don't have to sacrifice style or making a lasting brand impression because of limited resources. Check out these inexpensive set ups that are designed to get you noticed. 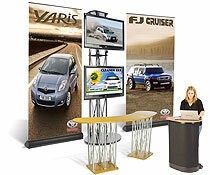 These exhibit configurations are some of our most popular. They're affordable, dynamic, and they won't stop working for you even when you're wiped at the end of a long show. 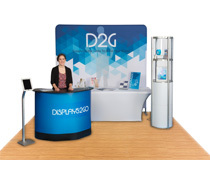 In the market for a fully customized trade show booth? This selection of all-in-one kits includes the event fixtures you need most with powerful brand impact via custom graphics. If you think attending a trade show is just plain out of reach for your small business or start-up, well, think again. 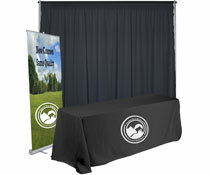 It is possible to outfit a typical 10' x 10' trade show booth on the cheap while not sacrificing style or brand impact! If you're looking for a way to increase foot traffic in your trade show booth, giveaways can help tremendously. We're just saying, who doesn't love free stuff?